I unfortunately have no idea how thick 10ply or 8 ply is, but you should be fine as long as your hook fits the yarn that you are using. If your yarn and hook are smaller, you will probably just end up with a smaller plush? Hey! If you’re looking for heavier weight yarn, I recommend searching online. There are Aussie retailers with Aussie made yarn waiting to ship to you! And no, you won’t fine the weight of yarn that Amigurumi patterns call for in Oz, sadly. Not without ordering online. Or going to a “yarn store” as opposed to a craft or convenience store. But you can take solace in the fact that America doesn’t carry yarn in convenience, dollar, or grocery stores! 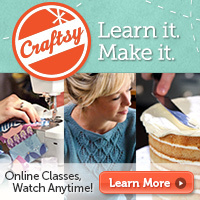 Just craft and yarn stores! HA! I am using 2 strands of 8ply together, with the same hook size in the pattern. It’s coming out fine. I didn’t think ply would be a consistent way to measure yarn thickness, because you could have each strand be thicker or thinner. It’s more about gauge, which I understand better in knitting terms (worsted weight is most comfortable at around 18 stitches in 10 cm). The yarn label should give recommended hook size, so that’s what you want to match with the pattern. While at Spotlight looking for yarn for thus project I found Lion Brand Heartland Thick and Quick in a chocolate-y tweed. I couldn’t find a ply on the packaging and my darling 7 month old has now destroyed the majority of the label but it’s much chunkier than an 8 ply. Hopes this helps others in Australia in their hunt for yarn! If you can get red heart yarn, that’s worsted yarn. Super saver. Try their website, redheart.com. good luck! 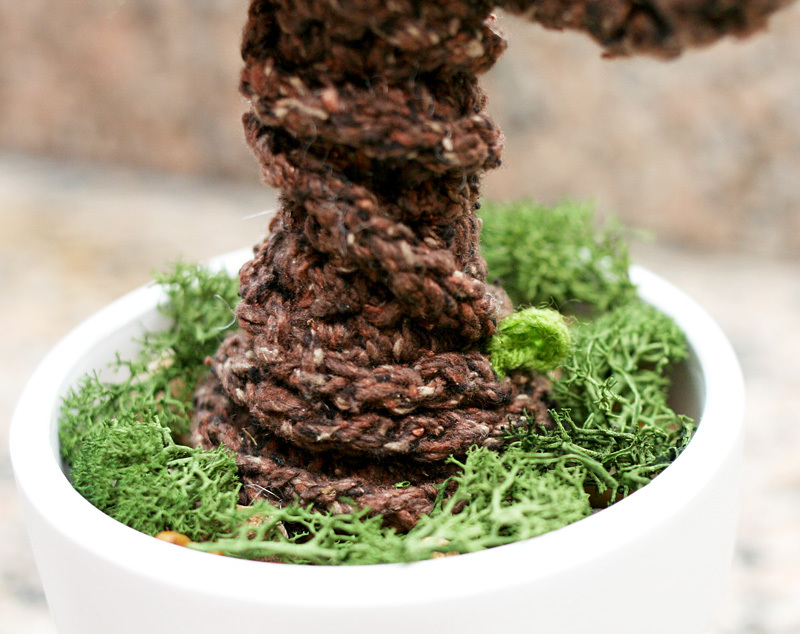 I have used both sport weight and worsted weight yarn on this project. the only difference was that I had to double rows to achieve the same size as the pattern when using sport weight yarn (4ply). 8ply yarn should do fine. If you do a search for yarn weight conversion chart, you can find what you need. There are usually some on yarn sites, but I have found that searching for the chart is easiest. I often find UK patterns that I like and have to convert to US. They will also tell you how to convert hooks. Don’t worry about being new! I have made several projects since my granny square days and some have turned out well and others…well, let’s just say that my pets have comfortable toys and cushions! 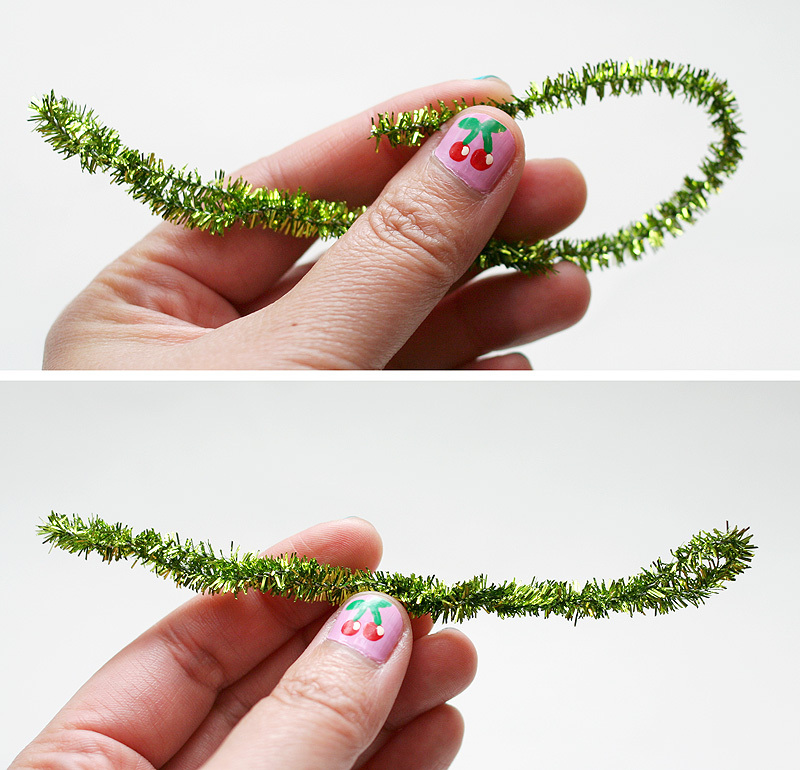 You could try crocheting a skinny rectangle and then sewing it together to make a skinny tube. 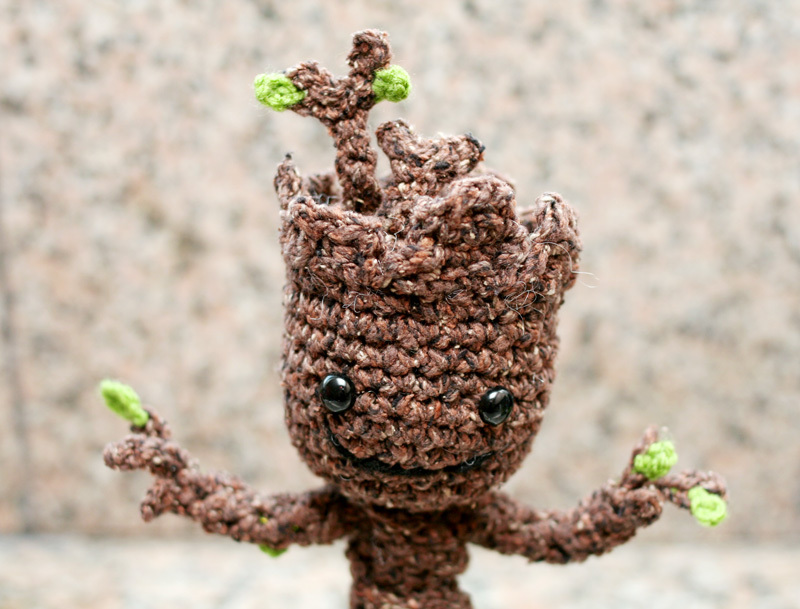 I was aiming to do this in 4ply for a tiny baby groot, so I’ve got more stitches because a tube of 4 stitches was too small. I chained 9, turned, missed 1st chain then sc8 back along. I slip stitched onto the 1st stitch to form a tube and continued in spirals from here. 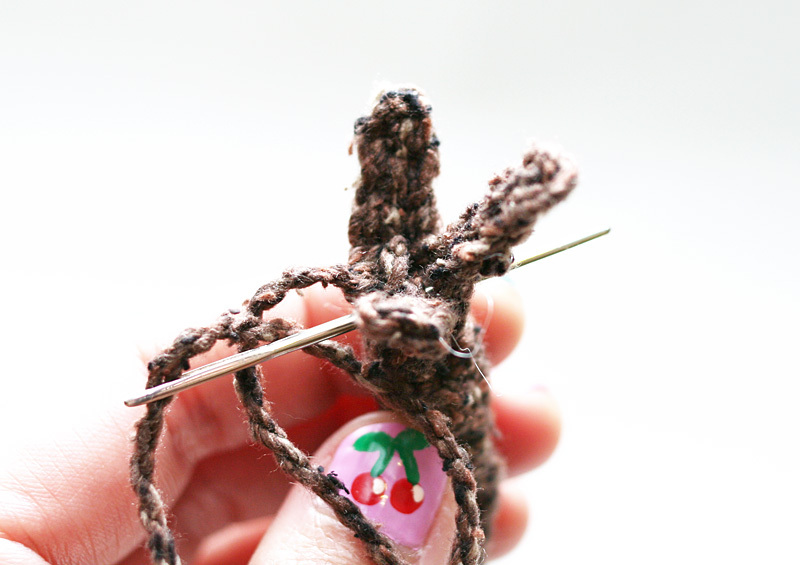 I also threaded the tube onto a 5mm hook as it’s easier to hold the tube on the hook while you work the stitches. My hook is bright red so it makes the stitches easier to see. Loving the pattern, it’s really cute. Hi, i had the same problem with the arms, i only mabaged it by placing a smaller (3.5mm hook no grip) in the middlr after the first 4 sc. This helped keep the middle hole open. I also then place a stick marker in all 4 sc to find the loops and moved the marker each time i did a stich, took a while but turned out great. Hi, for the first round, don’t turn, just keep working around and around in a spiral. DAMN! I thought I wasn’t supposed to join them at all until it says in round 11 to slip stitch into the next stitch. Then I sl st them together, did the broken head bits, and whip stitched the back of the head together. Hopefully it still comes out ok! Sorry about that! Usually when you don’t join rounds, it means to continue to work in a spiral, rather than joining with a slip stitch each time. So just checking, because I’m fairly new to crocheting as well, instead of joining the rounds with a ss, I’m just going immediately into the next round by sc 2 stitches into the six I’ve just made? 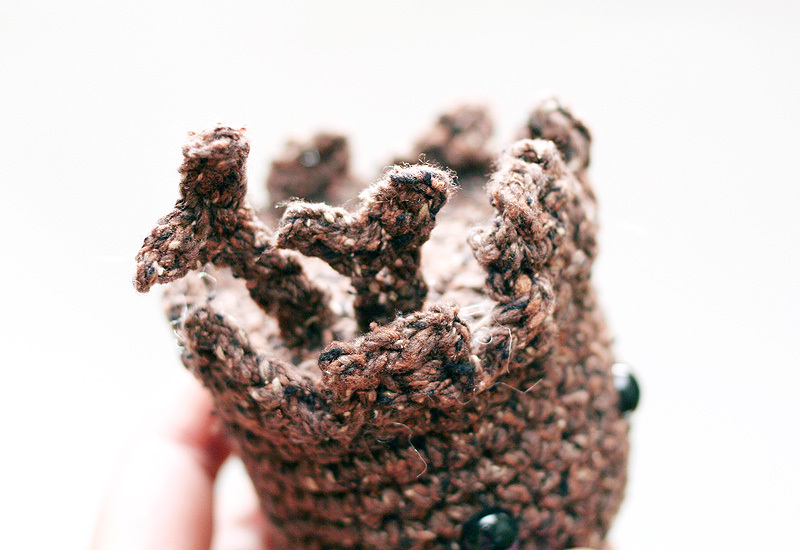 Thank you so much for sharing your pattern– just finished my Baby Groot and I love it! You are very talented and your pattern was easy to follow…looking forward to more of your work!!! Hi! 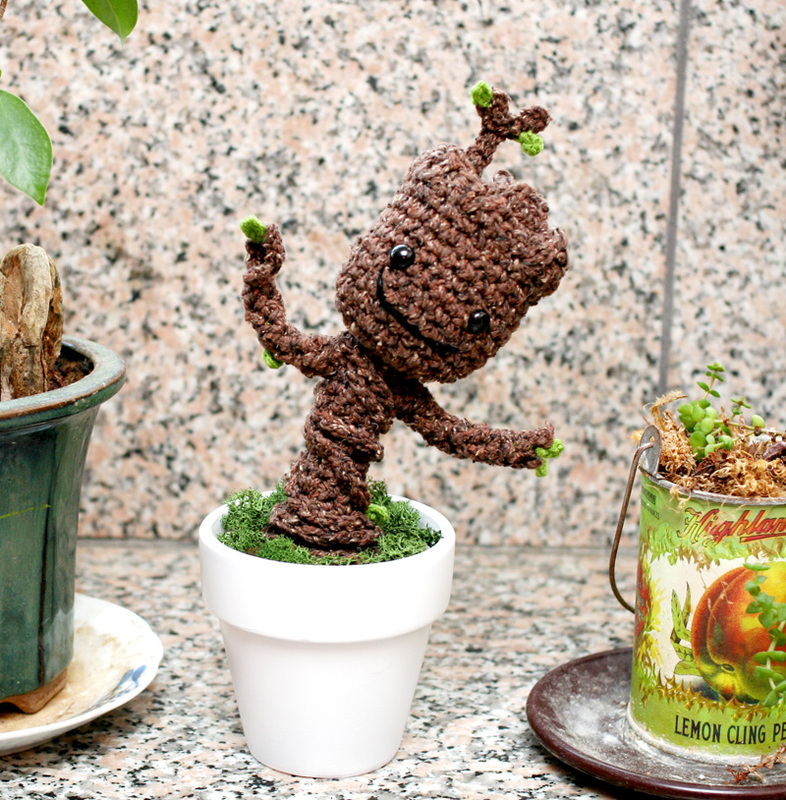 First of all, is the cuttest baby Groot I´ve seen ! 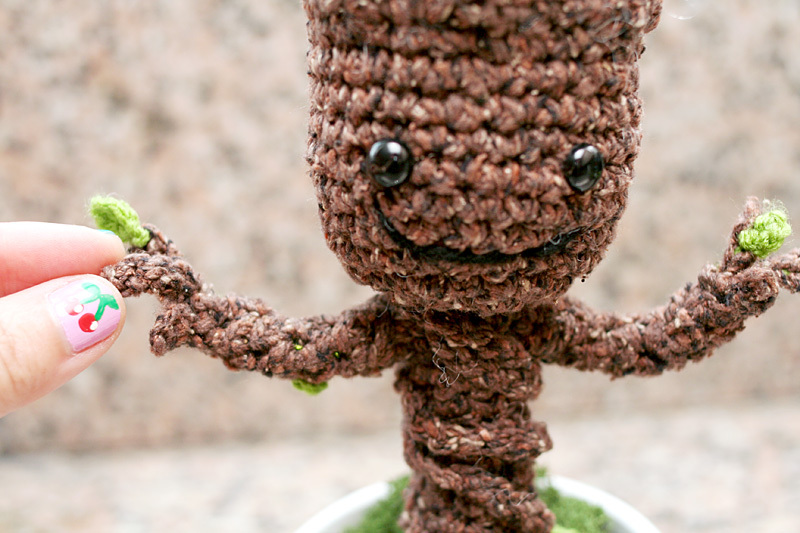 I wanted to made one, but I don´t know crochet. Although I have a cool mother that is always prepared for my freak stuff! I´m Spanish and she has some trouble with english. Do you have a pdf pattern or somethig like that to help her do it? I don´t know if I am asking too much, if so , sorry! 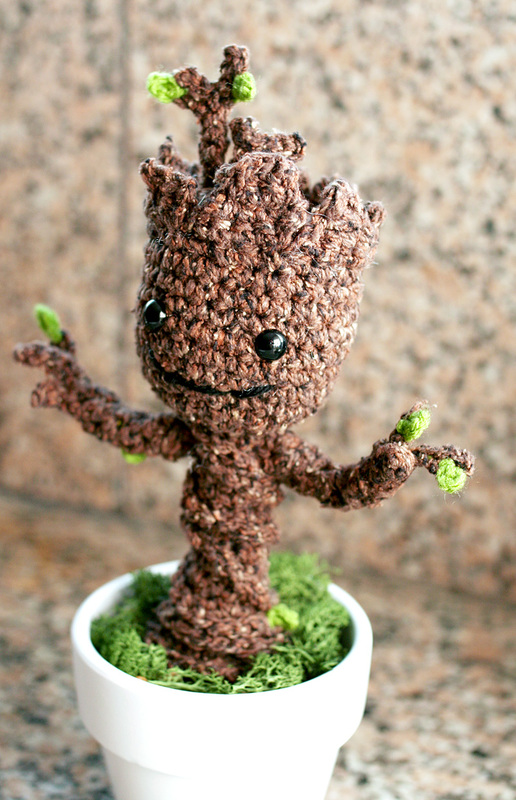 Just want a cute groot as yours! Hi! Sorry, I don’t have a PDF or anything. Most people have just been printing straight from the blog page. because our Shop does have the Chocolate Fudge by Rowan, but he have only 3 packs â 50g. Hi! I used less than one 50g skein. Robert, what shop has this? I’ve been having trouble finding a good substitute for the yarn, and I even checked my local specialty yarn shop. Thanks! Mercedes, I used a Kraemer Yarns tatamy tweed worsted in the color Walnut from my yarn shop. It was left over from a project and it worked really well. It is a bit darker that the Rowan, but still looks good. I bought Vanna’s choice in barley that is coming out nicely so far. Pingback: The Month In Review – August | Saz Creates! 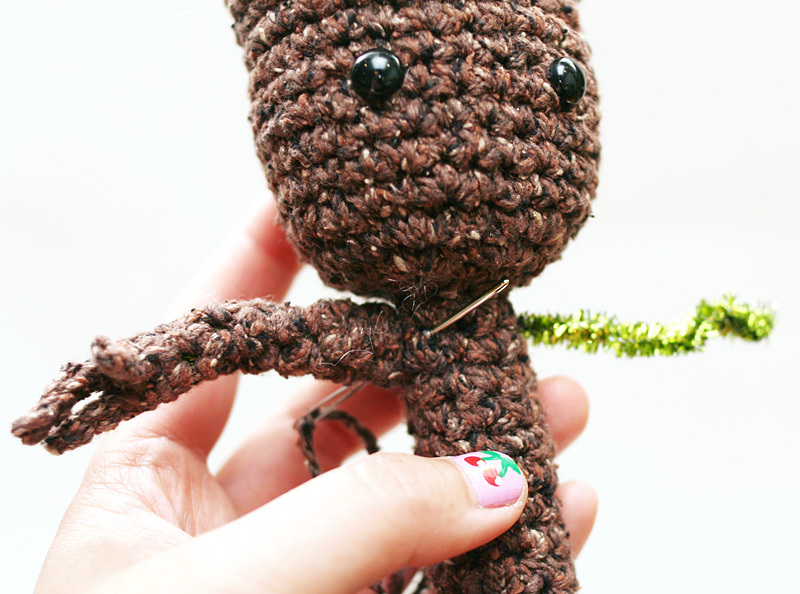 I barely crochet but I’m working my way through this because, squee, Groot! Thank you for this! I’m waiting for my safety eyes to come in so I can piece it together. Approximately how tall is your baby Groot? And what size pot did you use? Thank you for the pattern, it looks adorable and I can’t wait to try it out! Did you put pipe cleaners in the body? I didn’t, because I didn’t plan ahead and it was hard to push the pipe cleaners through the stuffing after the fact :P. I am going to film a video tutorial and use wire instead of pipe cleaners this time. Cuando subes el video a tu canal de youtube? When you upload the video to your youtube channel? I keep trying to find time to film it, but I have other deadlines coming up first! OMGoodness! He is adorable!! You are a treasure to make this for us! Yay!!!!! I am glad the pattern didn’t give you any grief! Oh my goodness, this is so excruciatingly adorable – serious cuteness overload going on here! Thanks so much for writing this up and sharing it! 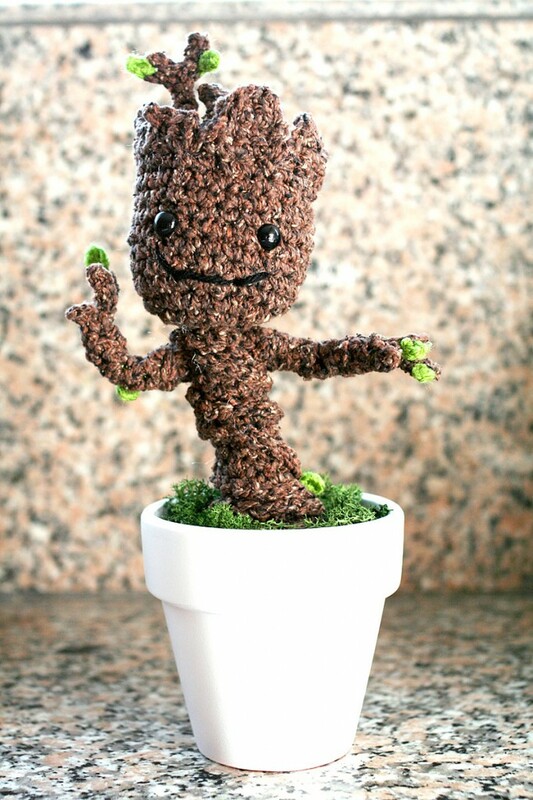 Im so in love with this baby groot of yours. And i want to have it in my bedroom and It will be great if you can give me one because i cannot do it I’ve tried but it didn’t work on me hahaha. So if you can help me with this, reply to my email please. 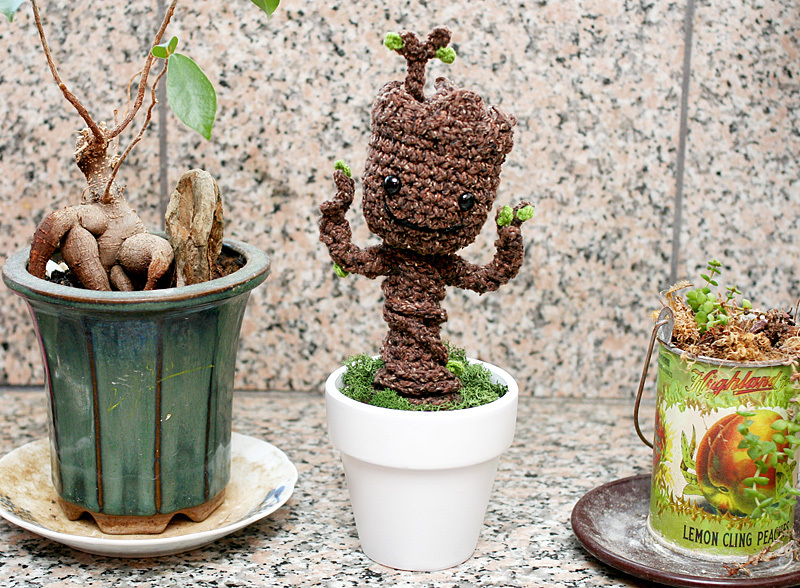 Thanks for your adorable baby groot that you have shared for us. Bye. Hi there! Sorry, I don’t have the time or money to make everyone one for free. 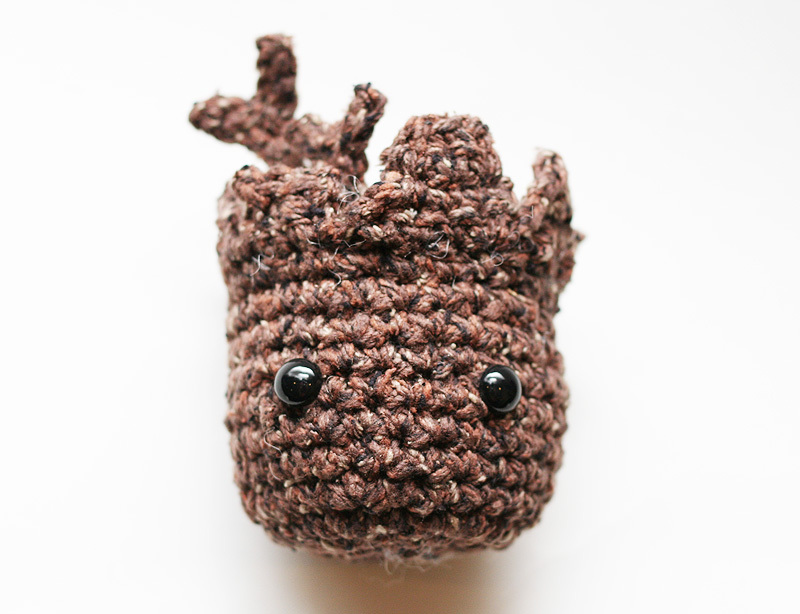 I’m planning to do a giveaway of maybe 3-4 Groots when I get a spare minute, but I keep delaying it due to other deadlines. Stay tuned! Would you be able to use rice or beans sewn in something to contain them, as a substitute to the Poly Pellets? Hi, yes, of course. But as I mentioned, I have read that beans might sprout, and I don’t know if the rice will spoil if there’s too much moisture in the air. But yes, it would technically do the job. I use a knee high stocking to hold stuffing or pellets. I also used drapery weights in the bottom. Or you can use the pellets, a stone, or a glass accent (flat round glass drop used in vases). Twist two pipe cleaners together for his backbone, add the weight, the pc, and stuff as you go. You can have him stay in place by sticking the pipe cleaner thru the body and in some foam. Use a slightly larger hook to make the “hole” larger to fit the pipe thru. I can email you pics. The branches were a bit floppy so I added a short piece of wire woven in the middle and secured under the top of the head. thanks fot the lovely pattern. Altough my son is already 17, he’s happy like a little child with his baby groot!!! I made one this weekend and it is adorable! Thanks for the great pattern. I wish I could crochet better! Can/has anyone convert(ed) this into a knit pattern? Hi! I’m not selling them, as I don’t have permission or a deal with Marvel, but I will be launching a giveaway on Oct 1st here. Stay tuned! Too cute saved to my notes , thanks for sharing looks like just a cute tree to me. I never crochet before but I want to try making one. Is there guide I should read for the basics how to crochet? Thank you so much. Hey thank you so much for the pattern. My friend is moving away and this is my little going away present, he practicly worships Groot. Oh will the body support the head cause it looks kind of heavy. Thanks for sharing this pattern. I will definitely be making some of these soon! Groot is adorable! Thanks again for sharing him! THANK YOU!!!!!!!!!!! This pattern has definitely made my day!! What a great pattern! I’ve only just started with hooks and not come out completely. I want to go translate to Dutch. But then I need to know if the pattern is written in the English or American? 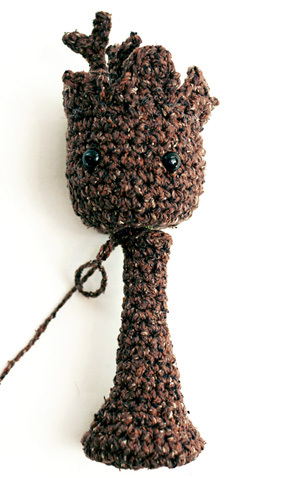 Thanks for this pattern, I’m fairly new at crochet but this pattern was super simple to follow and my groot has turned out great! =D so happy. 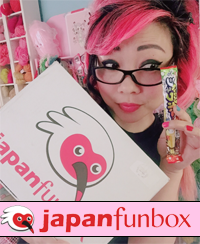 Translation: I love this and can’t wait to try it!! I was wondering how big is the finished baby groot? 7-8 inches? You can make him as long as you like. Giving Tree on steroids! LMAO. Love your description. 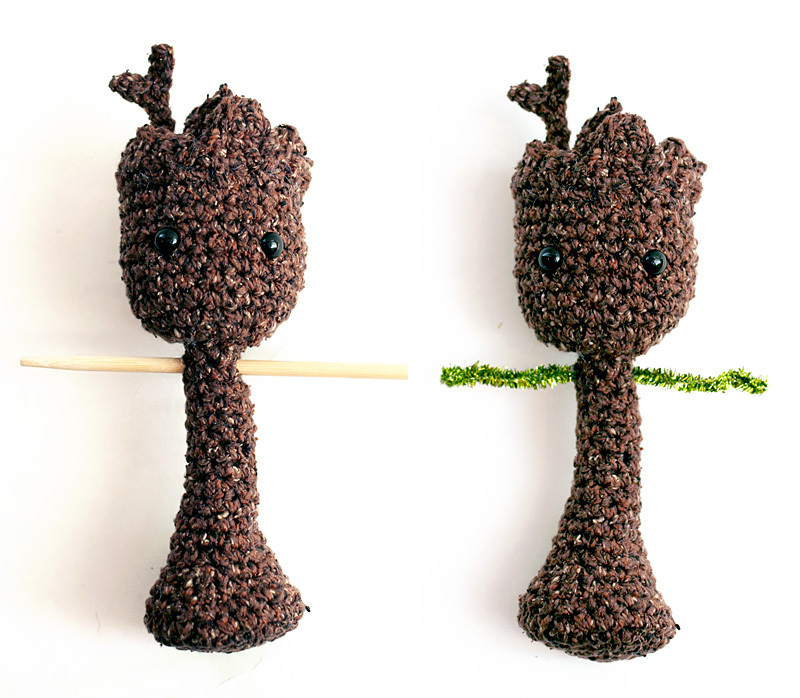 Looking forward to creating my own Groot one day. 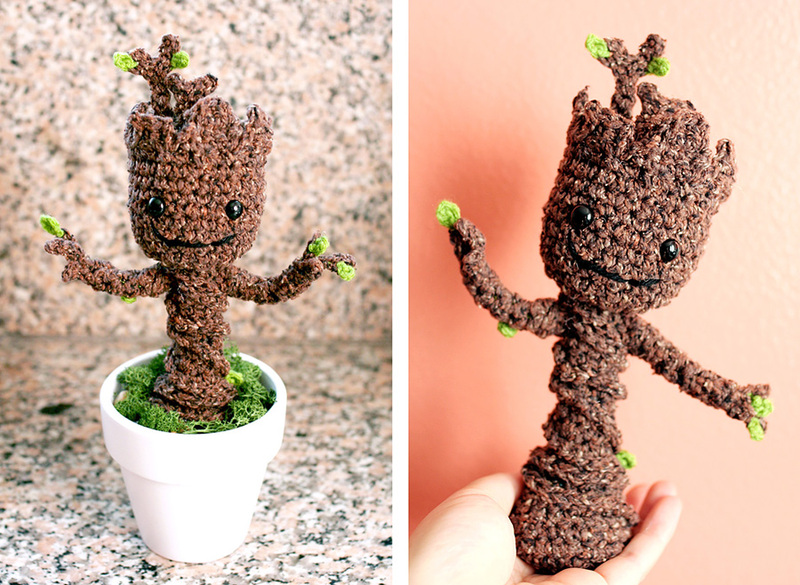 I made a groot for a co-worker of mine and she loves it! I did put a floral wire inside (a wire wrapped in paper from the floral dept of my local craft store. It’s quite a stiff but thin wire). I just put the wire through after stuffing Groot’s base area, and used rounded pliers to curl the bottom of the wire around the hole in the middle of his base. then I stuffed his trunk. It wasn’t too hard to get the stuffing in around the wire. I mean, he’s a lumpy tree, so it doesn’t have to be a perfect tube 🙂 I then curled the top of the wire into a little circle so no pointy bits would stick out of his head. As far as trouble with the pattern, I had a bit of trouble with the wavy head parts, but they are “random” enough that I just fudged my way along and he looks just fine! Thanks for the Grootorial!! My husband’s co-worker now wants one, and I will be making one more to raffle off as a door prize at the next craft show I am doing in November! Baby Grootwill rule the world! THANK YOU for sharing this adorable pattern!! My husband and I absolutely LOVED this movie…we keep taking grandchildren so we have excuses to repeatedly see it!! Can not wait to make this and surprise my husband! !